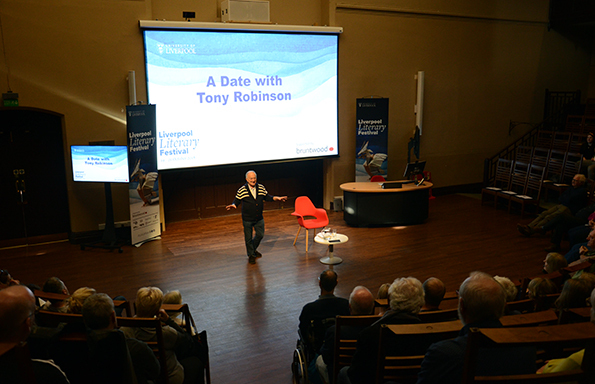 Hundreds of literature lovers attended Liverpool Literary Festival 2018; with talks, debates, workshops and discussions spread over three days. 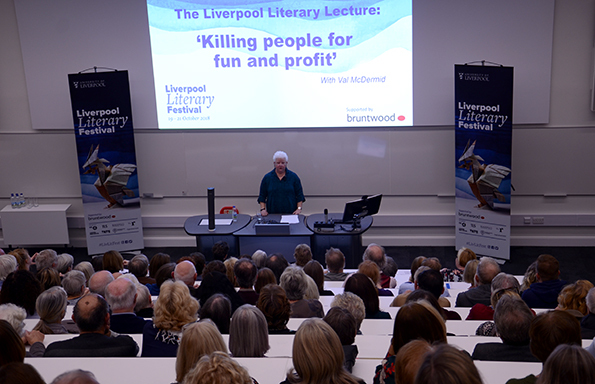 Tartan noir legend, Val McDermid opened the Festival with the Liverpool Literary Lecture. 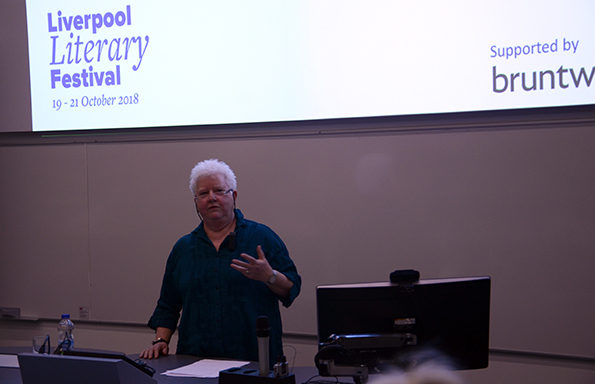 The sold out event saw Val regale the audience with tales of her love of libraries, her development as a crime writer and how important she felt it was to unveil the first lesbian protagonist in the genre. Val paid particular tribute to the influence of Agatha Christie, from whom she “consciously assimilated the idea that humour in crime novels was no bad thing”. Saturday, the first full day of the Festival, opened with a New Voices event featuring Booker Prize longlist nominee, Sally Rooney; the University’s Colm Toibin Creative Writing Fellow, Anthony Joseph; Lisa McInerney and Alex Clark. 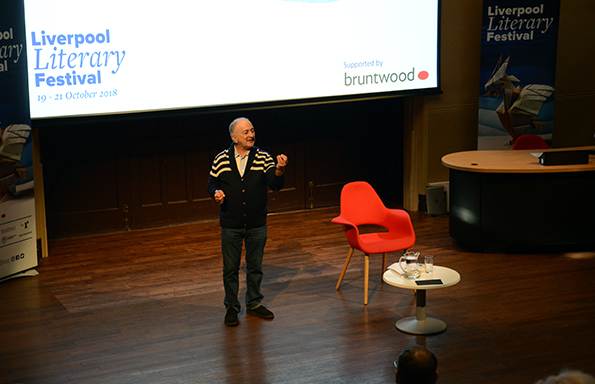 Later that morning, Festival headliner Tony Robinson, of Blackadder and Timeteam fame, brought plenty of laughs and literary insights for the sell out crowd. 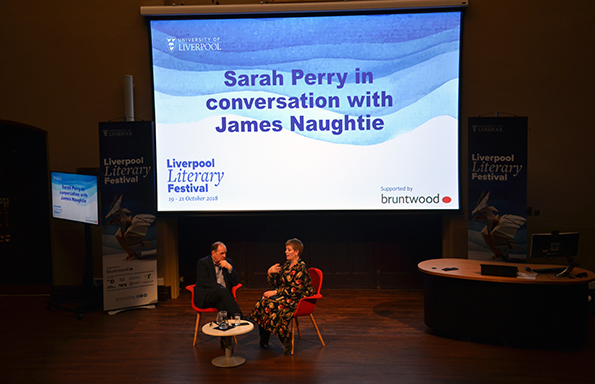 The Saturday evening brought Sarah Perry – whose new novel, Melmoth is being greeted with rave reviews – in conversation with the BBC’s James Naughtie. On Sunday morning, the Royal Society of Literature launched its Peace Poetry pamphlet at the Festival. 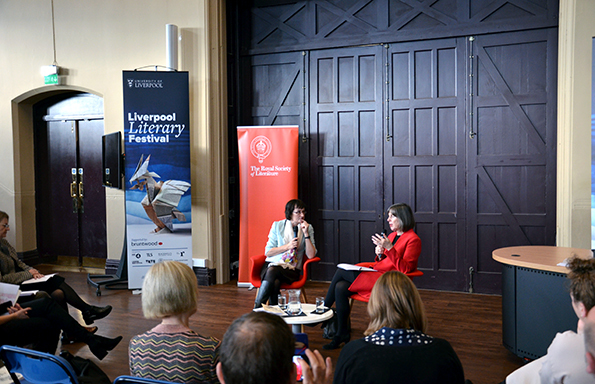 Here’s poet, Fiona Sampson in conversation with Vice Chancellor, Professor Dame Janet Beer. 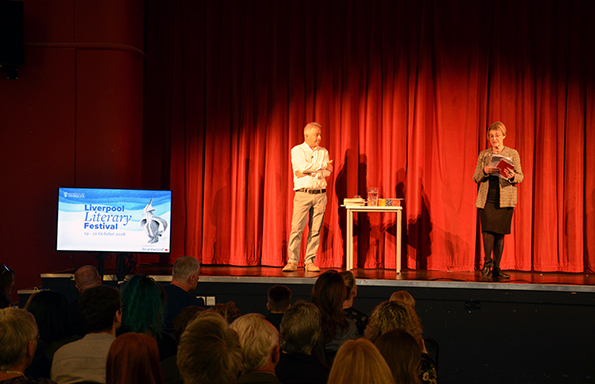 The packed weekend was rounded off by Merseyside literary superstar, Frank Cottrell-Boyce. Here he is being introduced by the University’s Professor Dinah Birch. 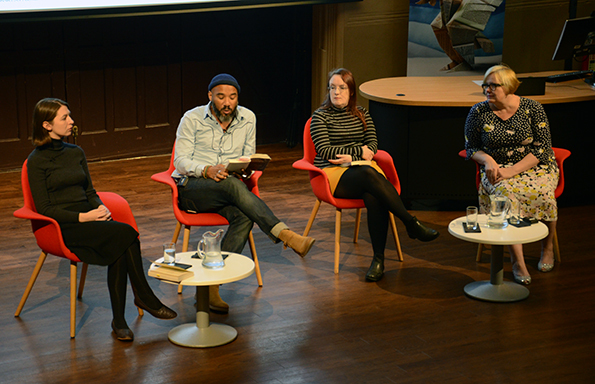 Search #LivLitFest on twitter for more photographs and commentary around Liverpool Literary Festival 2018. Liverpool Literary Festival 2018 is proud to be supported by Bruntwood.